The apostle Paul once said that everywhere he went, he preached the same message to everyone: Repentance toward God and faith in the Lord Jesus Christ (Acts 20:21). These are the two requirements to lay a good foundation in your life and to be born again. God has joined repentance and faith together. But most Christian preachers have separated them. 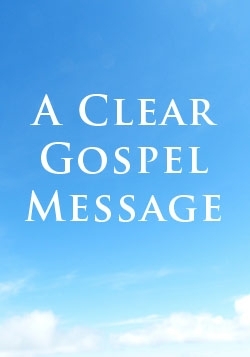 Repentance has been left out from most of today's gospel-preaching. Only faith is being preached by most preachers. Then believe in Christ. That means to commit yourself to Christ - and not just to believe something about Him in your mind. You can believe in someone without committing yourself to him. A bride is asked at her wedding, "Are you willing to commit yourself to this man?" Supposing she replied saying, "I believe he is a very good man. But I am not sure whether I want to commit my whole life and future to him". Then she cannot be married to him, because she does not have faith in him. When a woman gets married, her whole life's direction changes. She changes her last name to the man's last name. She leaves her parents' home and goes to live with her husband. She may not know where he will live, but she trusts her entire future to him. She has faith in him. That is a picture of what it means to have faith in Christ. The word "Christian" (to put it reverently) means "Mrs. Christ"! My wife could take my name only after she married me. In the same way, you can take Christ's name and call yourself a "Christian" only if you are married to Him. If some lady took my name without being married to me and called herself "Mrs.Zac Poonen" , that would be a lie. In the same way, anyone who calls himself a Christian, without being married to Christ is also telling a lie. This is a wonderful life - because we are living with the best Friend anyone can ever have. We will never be lonely, because Jesus will be with us always and everywhere. We can share our problems with Him and ask Him to help us solve them. It is a life full of joy and one that is freed from anxiety and fear - because Jesus holds our future in His hands. Lord Jesus, I believe that You are the Son of God. I am a sinner who deserves hell. Thank You for loving me and dying for my sins on the cross. I believe You rose from the dead and are living today. I want to turn from my sinful life right now. Please forgive me all my sins and give me a hatred for sin. I forgive everyone who has harmed me in any way. Come into my life Lord Jesus, and be the Lord of my life from today onwards. Make me a child of God right now." God's Word says, "As many as received Christ, to them He gave the right to become the children of God" (John 1:12). The Lord Jesus says, I will never reject anyone who comes to Me" (John 6:37). " Then you can thank Him saying, "Thank you Lord Jesus, for forgiving me and receiving me. Please fill me with your Holy Spirit and give me power to live for You. I want to please You alone from today onwards." You should now read God's Word every day and ask the Lord to fill you with His Holy Spirit daily. You also need to fellowship with other born-again Christians. Only thus will you grow in the Christian life and have the power to continue following the Lord. So ask the Lord to direct you to a good church.